Sherlock Holmes meets sci-fi. 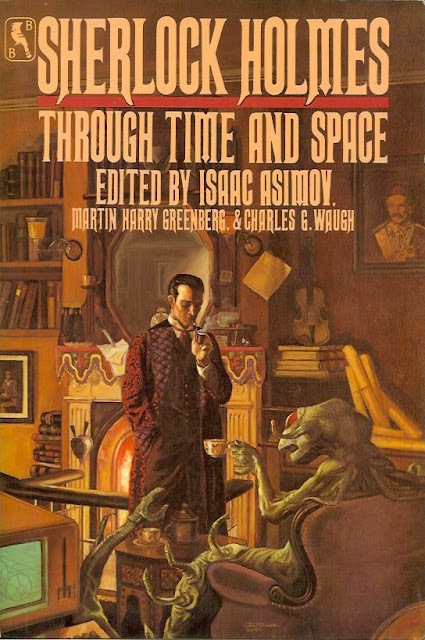 A collection of fantastical Holmes tales by well-known science fiction authors. In this outstanding collection of Sherlockian tales, the master of detection solves the most fantastic cases pf his career. Herein are answered questions which have plagued loyal readers for decades, including: What is the truth about the mysterious seance of Sumatra? What occurs when Holmes must pursue and extra-terrestrial? Is it possible that there is an alien Sherlock Holmes? What is the dreadful truth behind the disappearance of J. Adrian Fillmore? These and other matters are thoroughly and delightfully solved by a distinguished group of authors including Sir Arthur Conan Doyle, Isaac Asimov, Poul Anderson, Gordon R. Dickson, Philip Jose Farmer, Sterling Lanier, Gene Wolfe, Edward Wellen and others, for your amusement and edification.